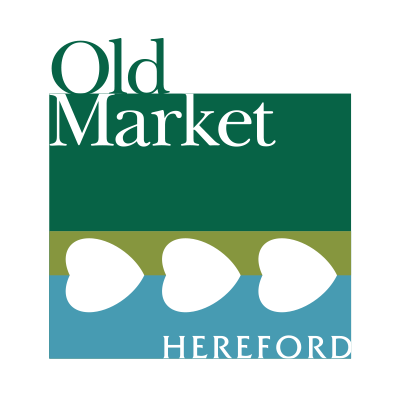 I went to the Old Market Hereford last evening around 6.20pm to find half the shops closed? Joules, Vodafone, Fat Face and Pandora all closed, I thought this centre was supposed to be open until 8pm every week night? I have a friend who works in one of those shops - I shan't name it - and they have said it's not worth paying staff until 8.00pm, when customers aren't coming through the doors. Simple economics I suppose. Perhaps now the excitement has died down, and the cold, dark evenings are upon us, late opening every night just aren't viable. Maybe things will pick up in the run up to Christmas. After all, traditionally the High Town shops stay open for late night shopping on Wednesdays, in the six weeks preceding the big day. It's all a con, the place has not even been open 6 months! So these shops have not given it a full year yet, secondly, I was still charged full price for the car park the other night when I was there, so where is the reduction in parking fee's if half the shops are not open?? Excellent point Paul. Why state that your open until 8pm when this is not the case? People will just go to Cribbs Causeway, Cabot Circus or Merryhill because those places are open during the hours stated. We had the same experience a few weeks ago. I am really surprised because this new centre is not fully operational and not all the units are open yet, so this is very poor. Surely this should be part of the contract of renting the units, once one starts to close early others will follow. We had a coffee and saw several people wanting to go into Fat Face and you could see their disappointed expressions when they realised it was closed and this was only around 6.30pm. Once people realise that these shops are closed after 6pm they will just stay away, so the numbers will just continue to fall, simple economics..
Not the best comparison, B & Q have always had seasonal opening hours, so this is nothing new. The stay open until 9pm during the summer months. I agree with you Mick 100% not the best of starts for the new Â£90M shopping centre. Does anyone know if there will be extended late night shopping over the festive period or is 8pm as good as it gets? 10pm late nights would be good, especially for those people working shifts and getting home later because of the darker nights and worse weather but I suspect that there will be no late night shopping, lets see..
ragwert, seasonal opening hours were in operation at B&Q as far back as 2006 when my son worked there and as far as we are aware it was the same before he joined the company. This is a slightly separate topic to the one started here though. We were in town and have just got back, I noticed that the new Pandora shop has their opening and closing times at the bottom of their door and it states 6pm. In my opinion car park prices should be reduced of parking should be free after 6pm then. Disappointing. Also car park is free after 8pm at the Old market. 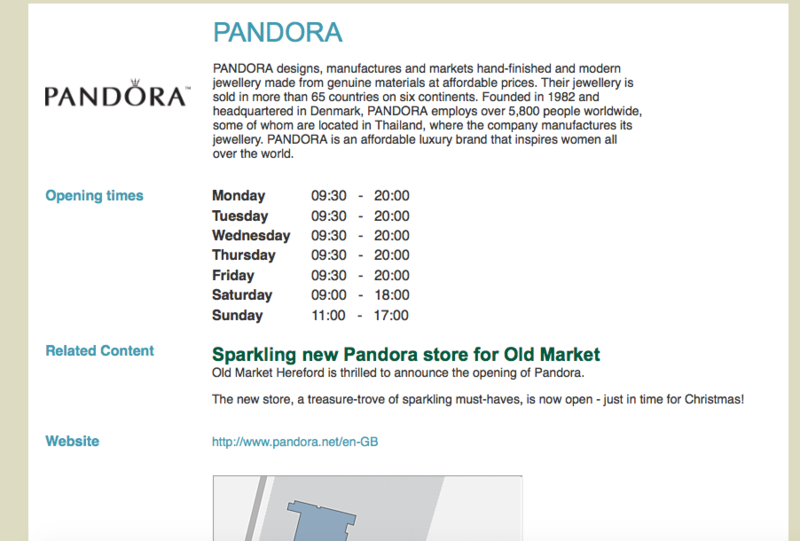 I clicked on Pandora Hereford and well, have a look yourselves, it states 20.00 but they close at 18.00. I am going to the cinema for the first time later so I will see what it says on their door. I was so looking forward to the new shopping centre and as good as it is, I feel it could be a lot better. Shocked that there was no roof, so the streets surrounding the stores with be deserted once winter kicks in and the constant rain arrives. And yet just a few weeks back, Mr Johnson wrote a letter to the Hereford Times, proclaiming that all was fine and dandy and going great! I said then we were still in the "honeymoon period." I would say that this time next year would be a better time to evaluate it's success. And by success, I also mean taking into consideration the impact on High Town, be that positive or negative. It really is too soon to say either way, but this certainly isn't a promising indication. I was in town yesterday afternoon with a friend and in all honesty we thought that both the new shopping centre and high town were both very busy, I appreciate that there were a lot of people around to commemorate remembrance day but this was after 2pm. We noticed Widemarsh St was very busy with people walking between both centres too. I do get frustrated though with the queue of people waiting for the traffic to stop at the Wellington pub crossing, a foot bridge comes to mind..
We went to the cinema last night and I can confirm that Pandora show their opening times on their door. It says they close at 18.00? I agree with Rebecca, this is confusing when you look at the opening times listed on the website above as 20.00 and this is from day one! Car park is expensive in the first instance in my opinion. Parking should be free after 6pm! I live on Aylestone Hill and I've not yet been to this new development ... Car parking is an area I don't pay for ... Not in somewhere like Hereford! Dead on it's feet then trying to drive people away in the car parks! Crazy logic! Yes its could of been a lot better. I thought all the shops were open until 8pm which made this complex stand out from high town, glad I now know that is not the case, so this place is nothing special after all then.